Remounting horses during a race will be banned from next month under new rules set out by the British Horseracing Authority (BHA) for the safety of both horses and jockeys. Riding school owners and instructors from across County Durham saddled up for a free training day to get their health and safety knowledge up to date. Representatives from 16 riding schools across County Durham attended the special event on 5 October at South Causey Equestrian Centre in Stanley which was organised by Durham County Council in partnership with the Health and Safety Executive (HSE). The aim of the event was to provide business owners and instructors with practical, common sense guidance on health and safety at riding schools. This covered areas such as complying accident reporting, manual handling, personal protective equipment and the general safety and welfare of staff and visitors. There was also a session on how to prevent the health problems dust can cause and an equine fire safety expert offered advice on how to protect against arson and general fire prevention. Ian Bousfield, Senior Environmental Health Officer, who helped organise the event, said: "We are delighted with the take up and interest shown in the event by local businesses. It has been both informative and enjoyable for everyone concerned and we hope to run similar events in the future." Paul Spurrier, Partnership Manager for HSE in Yorkshire and the North East, said: "It is great to see councils taking the initiative and working with us to provide free events for small businesses and individuals so they can benefit from up to date sensible health and safety advice. We hope that the riding schools owners and instructors got a lot out of the day and that more free events like this can be provided in the future." Horse riders across the UK are joining together to urge the Government to think again about imposing an “unfair tax in all but name” on every horse owner in the UK. The “Rethink the Horse Tax” campaign, launched today by a coalition of organisations representing a broad cross section of the UK horse industry, is calling on riders, breeders and veterinarians to make their voices heard by visiting a new campaign website – www.RethinktheHorseTax.org – and take action by writing to their constituency MPs and by signing an online petition to the Prime Minister. Campaigners are further concerned that plans to create a new agency will place mounting costs on horse owners at a time when Government support is needed to help boost rural economies and encourage wider participation in outdoor sport. Under the plans, horse owners would be charged on the same basis as keepers of livestock farm animals such as sheep and pigs – despite the fact that a significant proportion of horses are kept for leisure and sporting, rather than commercial activities, paid for from of income that is already taxed. Veterinary surgeons have also made it clear that plans to create a new agency responsible for animal health could needlessly complicate the process of managing outbreaks of animal disease animal health, putting at risk the clear single line of command essential in the event of a major disease outbreak. A lack of clarity over the roles of the four Chief Veterinary Officers in England, Wales, Scotland and Ireland in the proposals has also been highlighted as a major concern by the campaign. And campaigners have further highlighted the fact that the new body would spend much of its time collecting charges from people who own just one horse (65% of horse owners), meaning that the cost of physically collecting the charge will almost outweigh the charge itself – an estimated £2.3m would be needed to collect just £4.5m from horse owners under the plans. With costs of £14.3m to set up and millions more to maintain the new body in the coming years, campaigners have made it clear that the proposals do not represent value for money for either the equine community or the taxpayer. · Under the proposals, horse owners would be charged an annual fee of £10.50 per animal (as set out in Defra’s Impact Assessment). · The new Bill has yet to be debated in the Houses of Parliament. The National Equine Welfare Council has launched the third edition of the Equine Industry Welfare Guidelines Compendium at this year’s British Equine Veterinary Association (BEVA) Congress in Birmingham. This third edition reflects the significant changes in animal welfare legislation as well as improved scientific knowledge of welfare issues. Whilst previous editions were used extensively in supporting welfare investigations and legal proceedings, the new edition is designed to assist anyone responsible for the welfare of horses, ponies and donkeys in meeting their obligations under the new welfare legislation in England, Wales and Scotland. More about NEWC… The National Equine Welfare Council was set up in 1977 with the aim of uniting the equine welfare industry and raising welfare standards nationwide. It now has a membership base of over 60 welfare organisations, including equine welfare charities large and small throughout the United Kingdom as well as a multitude of organisations from the equestrian and veterinary sectors of the horse industry. Its work includes support for small welfare organisations, making representations to Government and advising individuals. It also produces a Code of Practice for those organisations involved in the keeping of horses, ponies, asses, mules & donkeys and supports members by providing up to date information, running annual seminars and representing them to Government and other bodies. Member organisations include involved in the keeping of equines can be relied upon to achieve excellent standards of care for their animals. Many operate loan schemes whereby horses and ponies go out on loan to inspected homes whilst remaining the property of the charity and being protected for the rest of their lives. Visit www.newc.co.uk for more information. ‘Responsible Re-homing’ and ‘Cutting Cost without Compromising on Welfare’ are two leaflets that have been produced by NEWC in response to the high number of requests for help that our members are receiving from horse owners struggling financially across the UK. The leaflets have been produced as a result of collaboration between members of the National Equine Welfare Council. Riders in Buckinghamshire are set to benefit from two new safety initiatives. 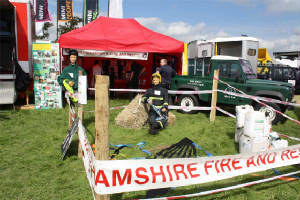 At the County Show, Buckinghamshire Fire & Rescue Service, supported by local organisations and a charity gave away over 500 Rural Safety Packs providing hints and tips on how to make agricultural, equine and farm-related property and buildings safe and secure. · Nameplate -- is your house/farm sign displayed at the entrance? · Fire hydrant - which is your nearest Fire hydrant? · Water supplies -- location of available additional water supplies for example tanks, ponds, rivers? · Evacuation plan -- is a written animal evacuation plan available at all times? · Dangerous animals -- stables/stalls/fields identifiable if you are not there? · Flammable risks -- what materials do you have on site and a suitably stored away from fire risks? · Chemicals -- what chemicals are stored, how many and where? Are they marked with the relevant safety instructions? · Fuel/diesel -- supplies/tanks/pipes clearly marked? · Staff – Are your staff aware of emergency procedures and contact numbers? · Housekeeping -- are your electrics, workshops and yard is maintained and kept tidy? · Public -- are you hosting the general public on your property? How many are likely to be present? Agricultural buildings -- how many buildings do you have on your site? What size are they and what is their current use (animal, crops, hay, chemicals, machinery)? Community safety partnership manager Jo Oliver from Buckinghamshire Fire & Rescue Service said: “We and our partner organisations don’t tend to think of the members of our farming, equine or agricultural communities as being vulnerable, but they are definitely a group that we find hard to reach and don’t often come into contact with other than at barn, farm or field fires. In the second initiative, Buckinghamshire Fire & Rescue Service has begun a joint initiative with local horse welfare charity, The Horse Trust, and Thames Valley Horsewatch, to help ensure that firefighters are better prepared if called to help a large animal in difficulty. Firefighters are sometimes called out by concerned owners and members of the public to help rescue animals that have got into difficult situations, and national guidelines are currently being set up to ensure best practice procedures are used nationally. The joint initiative was developed to ensure that firefighters have the skills, training and equipment they need to maximise their own safety and minimise the risk of further injury to the animals they are called to help. Area Manager Denis O’Driscoll, who heads up Buckinghamshire Fire & Rescue Service’s Operational Response Department, said: "Although we do not receive a large number of these types of calls, we know that there will be occasions where we will need to undertake this kind of activity. As a result, we need to ensure that we are adequately prepared and equipped to deal with these incidents and we are grateful to The Horse Trust for the support and assistance that they are providing. This is a good example of an increasing number of joint initiatives and collaborations that Buckinghamshire Fire & Rescue Service is engaged in that will provide real benefits to our local communities." Among the large animals Buckinghamshire Fire & Rescue Service is asked to assist are horses, usually those who have got themselves stuck in ditches, stables or cattle grids, but also to horses trapped in overturned trailers on roads or motorway. It is also possible that firefighters could be called to a fire at an equestrian yard or stables. When trapped in unusual conditions, any animal is likely to become frightened, which can make a situation more dangerous both for the animal and firefighters. The Horse Trust has provided horse-handling training to members of operational staff from Buckinghamshire Fire & Rescue Service. During evening sessions at The Horse Trust’s stables in Speen, firefighters from Great Missenden and Winslow were taught about animal behaviour and awareness, as well as how to approach and catch horses safely. The Horse Trust has also given Buckinghamshire Fire & Rescue Service a grant of £11,636 to enable them to buy the specialist equipment needed for the rescues. The specialist animal rescue teams will be formally launched later in the year. The Horse Trust (www.horsetrust.org.uk) is the oldest horse charity in the world, originally established back in 1886 to help the working horses in London. Its expanding welfare department has a number of initiatives underway which will provide tangible welfare benefits to horses in our area and their owners, as well as emergency service and partner organisation personnel. These include provision of specialist horse training which will prepare and equip emergency responders to deal safely with horse encounters and increase safety for all present at the scene. Thames Valley Horsewatch (www.thamesvalleyhorsewatch.org.uk) is a Thames Valley Police initiative to combat equine crime and aims to raise awareness of equine crime and improve communication and security among horse owners and riders. It was with much sadness that the Trustees of the BHS and the members of the British Riding Clubs National Executive Committee learnt that Laurie Punnett died on Thursday 23 July. BHS Chairman Patrick Print said "Whether it was as a Trustee of the BHS, Chairman of the BRC NEC or Chairman of Gower Riding Club, Laurie's commitment was total. “In his element as a cross-country controller, witty and informed in the commentary box and totally dedicated as 'chef d'equipe’ for his wife Sarah, Laurie put his heart into the Riding Club movement, earning the respect and affection of all those who reaped the benefit. I will not be the only one mourning the loss of a very good friend today." A donkey escaped being burned to death in a suspected arson attack at stables in Scarborough. A specialist equine barrister is urging horse owners to scrutinise their insurance closely after learning that many policies do not cover third-party liability when a horse is being cared for on a livery yard, by a visiting practitioner or by a horse-sitter. A woman is in a critical condition in hospital after she was hit by a truck. The accident happened on 19 July (10 a.m) as she was out horse riding on the R666 road to Fermoy, Co Cork. The Irish Independent reports that the 52 year old woman remains in a critical condition, having suffered serious head and chest injuries. The horse was killed instantly in the accident. A girl had to be airlifted to hospital after she was kicked by her horse which she is thought to have been walking alongside. The Criminal Records Bureau (CRB) has announced that it will reduce the fee for Standard Disclosures from October with total savings to customers of £1 million. Following a pricing review, the government agency has agreed to reduce the fee charged for a Standard Disclosure from £31 to £26. prevented a further 18,000 unsuitable people from gaining access to children and vulnerable adults as a direct result of a CRB check, bringing the total to around 98,000 in the past five years. The CRB was established under Part V of the Police Act 1997 and commenced operation in 2002. It provides access to criminal record information through its Disclosure service. It enables organisations in the public, private and voluntary sectors to make safer recruitment decisions by identifying candidates who may be unsuitable for certain work, especially that involving children or vulnerable adults. A horse stuck in the mud on Monday was in danger of being put down until it managed to pull itself out. Vets and fire crews in the south-east held a "local rescue meeting" on Tuesday (7 July) as part of a continuing drive to make horse rescues safer and more efficient. The initiative builds on the "emergency services protocol" launched in May 2007 by BEVA and the British Horse Society (BHS), after H&H reported a worrying variation in the way police and firemen handle 999 calls involving equines. Four horses have been injured, one critically, as three barns burned at Pink Star Equestrian Center, Eastern Pennsylvania. Most of the farm's 30 horses were in pastures and stayed away from the flames. Fire broke out around 11 p.m. Thursday 9 July at the farm near Limekiln in Oley Township, about 45 miles northwest of Philadelphia. It took more than 120 firefighters from 30 fire companies in Berks, Chester and Montgomery counties to get the fire under control. Officials are investigating the cause of the blaze, which leveled two barns, left a third partly standing and is estimated to have caused damage in the region of $700,000 to $1 million. It’s reported that the four horses injured in the fire are expected to recover. However, two of the horses suffered severe burns to their backs and damage to their lungs. One of the two also suffered burns to its head and side. The owner said that neither horse will ever will be ridden again and one may lose its vision. A Pennsylvania woman on a trail ride died on Thursday evening (9 July) when the horse she was riding in Madison County reared and fell on her. A man in his 60’s, found unconscious, was airlifted to hospital after falling from his horse on a disused railway track in Prescott, Cleobury Mortimer. It’s believed that the horse may have rolled on him. He was treated at the scene for a minor head and hand injury and taken to Worcestershire Royal Hospital for further assessment and treatment. The Association of British Riding Schools (ABRS) is holding its Annual General Meeting and Conference on Monday 19 October at Shrigley Hall, Pott Shrigley, Manchester, Cheshire SK10. 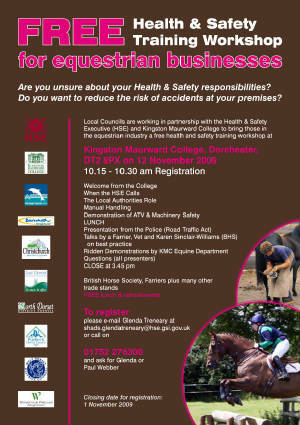 Local Councils in Dorset are working in partnership with the Health & Safety Executive (HSE) and Kingston Maurward College to bring those in the equestrian industry a free health and safety training workshop. The workshop will take place at Kingston Maurward College, Dorchester (DT2 8PX) from 10.30 – 3.45 on Thursday 12 November 2009. Topics during the day will include how to comply with legislation and the supporting role of the HSE and Local Authorities. At a practical level there will be a focus on manual handling, ATV (quad bike) and machinery safety, human and equine personal protective equipment, supported by ridden demonstrations from the equestrian department at the College. Those attending will have the opportunity to ask questions in a friendly and relaxed environment. To register to attend this event e-mail Glenda Treneary at shads.glendatreneary@hse.gsi.gov.uk or call 01752 276300 and ask for Glenda Treneary or Paul Webber. Closing date for registration will be on 1 November 2009. The third edition of the Equine Industry Welfare Guidelines Compendium has just been launched. I’ve not yet met a horse owner who knew of the existence of the previous editions, first launched in 2002. They’re an absolute gem and I suggest everyone involved with the care of horses download a copy, and hang a hard copy in every yard. The guidelines represent good practice and can act as a basis for any other country wishing to set up guidelines of its own. They’re there to ensure the health, safety and welfare of our horses, ponies and donkeys. We owe it to them to read and act on them. The Health and Safety Executive (HSE) is warning businesses across Britain not to be duped into buying unnecessary and overpriced copies of its health and safety law poster. The poster is a fixture of every workplace in Britain and employers have a legal duty to display the poster in a prominent position or provide each worker with a copy of a Law pocket card. Both outline employer and workers responsibilities and where workers can seek advice. As from 6 April 2009, HSE is publishing new simpler versions of its approved health and safety poster and leaflet. Employers can, if they wish, continue to use their existing versions of poster and leaflet until 5 April 2014, as long as they are readable and the addresses of the enforcing authority and the Employment Medical Advisory Service up to date. There is some evidence of misleading promotions wrongly claiming that the old poster must be replaced immediately and that the new law poster should be displayed on every notice board within the business’ premises. This is incorrect and employers could be led to believe that they are not meeting their legal requirements. The Health and Safety Executive (HSE) is reminding employers of their duties to the safety of staff following an incident in Kettering where an employee fell six foot and suffered serious injury. Kettering-based Dodson and Horrell Limited were fined £2,000 and ordered to pay costs of £2,255 at Kettering Magistrates Court on Thursday 11 June, after pleading guilty to breaching Health and Safety legislation. Dodson and Horrell contravened Regulation 3(1)a of the Management of Health and Safety at Work Regulations 1999 in that they failed to make a suitable and sufficient assessment of the risks to the health and safety of their employees undertaking maintenance that involved working at height. On 17 July 2008, at the company's premises in Ringstead, Northamptonshire, a 53-year-old local worker was oiling the chains on a machine that stacks bags of animal feed onto pallets, when he fell approximately six feet, resulting in bruised ribs and a punctured lung. "The risks of working at height always need to be fully assessed as every month 1,000 workers suffer a serious injury following a slip, trip or a fall in the workplace. The outcome of this incident, the injuries and the subsequent fine remind us that the results can be serious for people and for businesses that fail to comply with their health and safety duties." 2. Regulation 3(1)(a) of the Management of Health and Safety at Work Regulations 1999 states: "Every employer shall make a suitable and sufficient assessment of the risks to the health and safety of his employees to which they are exposed whilst they are at work."